1. Short title, extent an commencement. 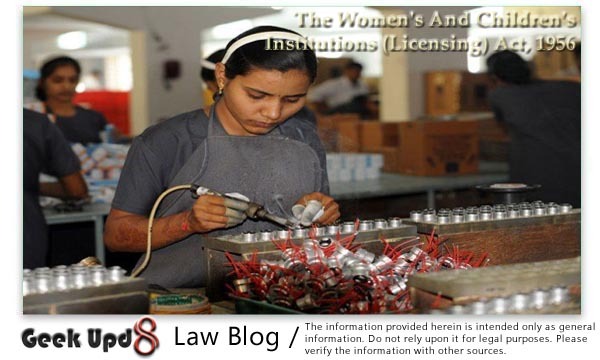 (1) This Act may be called the Women's and Children's Institutions (Licensing) Act, 1956. (3) It shall come into force in a State on such date as the State Government may, by notification in the Official Gazette, appoint. Broubht into fore in the State Andhara Pradesh on 20.2.1992. vide Andhara Pradesh Gazttee 19.2.1992 Part I Ex. page 1 (No 71). A large number of bogus children's houses and orphanges are existing in the country and exploiting destitute women and children. Inhuman conditions prevail in these institutions. In order to protect women and children from such exploitation, legislation is necessary to regulate and licence orphanges and other institutions caring for women, and children under eighteen years of age, and to provide for the proper custody, case and training for their inmates. Article 39 of the Constitution relating to the Directive Principles of State Policy lays down inter alia that "That State shall in particular direct its policy towards securing that childhood and youth are protected against exploitation, and against moral and material abandonment". This Bill seeks to secure the early realisation of this objective". - Gaz. of India, 1954, Extra.m Pt. II, section 2, page 28. (e) "woman" means a female who has completed the age of eighteen years. 3. Licensing of institutions. After the commencement of this Act, no person shall establish or maintain an institution except under and in accordance with the conditions of a licence granted under this Act. Provided that a person maintaining an institution at the com- mencement of this Act shall be allowed a period of three months from such commencement to make an application for a licence. 5. Grant of licence. (1) On receipt of an application under section 4, the licensing authority, after making such inquiry as it considers necessary, shall, by order in writing, either grant the licence or refuse to grant it. (2) Where a licence is refused, the grounds for such refusal shall be communicated to the applicant in the prescribed manner. Provided that a licence may be renewed on an application made within sixty days before the date of its expiration if the licensing authority is satisfied that there was sufficient cause for not making the application earlier. Provided that any such condition may require that the management of an institution shall, wherever practicable, be entrusted to women. (5) No fee shall be charged for the grant of a licence under this Act. Sub-sections (3) and (5) - The Committee have increased the period before which an application for renewal of a licence should be made to sixty days so that the licensing authority may have sufficient time for making necessary enquiries, if any, before renewing the licence. Provision has also been made for condoning delay if sufficient cause is shown. The Committee have further provided that renewal of a licence should be for such period as the licensing authority may deem proper. The committee are of the view that no fee should be charged for the grant of a licence unde this Act. Sub-section (5) to clause 5 has been inserted to make this clear. - S.C.R. 6. Licence not transferable. A licence granted under this Act shall not be transferable. (b) where such appeal has been preferred but the order of revocation has been upheld, from the date of the appellate order. The clause provides for the revocation of a licence for the brench of any of the conditions of its issue or the provisions of this Act or the rules made thereunder or where the licensing authority is not satisfied with the general conditions of management or superintendence of the institution , after giving an opportunity to the licensee to show cause why it should not be revoked . In the event of revocation of a licence, provision has also been made for the transfer of the inmates of the institution to another institution or their restoration to the custody of the parents, husband or other lawful guardian. (b) transferred to another institution. 8. Appeals. (1) Where the licensing authority is other than the State Government, any person aggrieved by an order of the licensing authority refusing to grant a licence or revoking a licence, may within such period as may be prescribed, prefer an appeal to the State Government against such refusal or revocation. 11. Power to make rules. (1) The State Government may, by notification in the Official Gazette, make rules for, carrying out the purposes of this Act. (g) the discharge from institutions of women and children and their transfer from one institution to another. (j) any other matter which is to be or may be prescribed. 12. Repeal and savings. (1) As from the date of commencement in any State of this Act any State Act corresponding to this Act in force in that State immediately before such commencement shall stand repealed. (2) Notwithstanding the repeal by this Act of any State Act referred to in sub-section (1), anything done or any action taken (including any directions given, any register, rule or order made or any restriction imposed) under the provisions of such State Act shall in so far as such thing or action is not inconsistent with the provisions of this Act be deemed to have been done or taken under the provisions of this Act as if the said provisions were in force when such thing was done or such action was taken and shall continue in force accordingly until superseded by anything done or any action taken under this Act. Explanation.-In this section, the expression "State Act" in cludes a "Provincial Act".